Has this ever happened to you? You attend a conference or participate in a class and learn some valuable information that will help you become more productive or improve your life in some way. You know that you will apply these principles as soon as you get back to your desk. When you arrive at your office the next morning, you first have to clear out your mail box to avoid getting “over the limit” messages, and possibly even be able to send messages. In between clearing out messages, you start catching up on the work you set aside while out of the office. Finally, you have to attend in-person and virtual meetings. By the time you get through all of this and resume your daily routine, it’s possible that what you committed to during the conference or class may have taken a back seat to the realities of life. When you find yourself in this situation, you can use the following self-coaching formula to make changes. This approach works in the workplace and at home (for you and in working with your children). 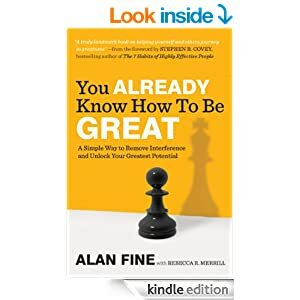 In his book You Already Know How to Be Great, Alan Fine shares the framework that he calls the GROW model. Alan was a sports coach, and developed this model to help athletes improve at their respective sports. He has worked with tennis player, golfers, and Olympic athletes. GROW is an acronym for Goals, Reality, Options, and Way forward. The first step is to determine the goal. As priorities shift, it is possible that the goal of attending a conference or class may have been lost. Taking some time to think about the goal, and – if possible- write it down again, can you help you regain your focus. The next step is to make a list of all of the realities of life that prevent you from achieving your goal. What are the constraints holding you back? Available time, lack of staff, changes of priorities, etc. are all possibilities that can derail achievement of a goal. The third step is to evaluate each reality identified in step #2 and list options for overcoming the constraint. This requires brainstorming, either as a group or individually. If your high school stuent is having a difficult time keeping up with homework because of not enough study time, possibly limiting access to social media and connecting with friends might be an option. The final, fourth, step is to identify a way forward. From the options determined in step #3, which of these can be implemented to keep you focused on achieving the goals that you can established? Create a specific action plan that can be followed. Ideally, responses to each of the steps in the GROW process should be written down and shared with the planning team (in a work setting) or yourself or child (at home). Use the GROW steps to stay focused on current goals and to regain the momentum lost when competing priorities become a reality in our busy environments.